If you are wondering what kind of marketing and communication strategies to implement in the age of the digital customer, then you are in the right place. Create, develop, maintain and optimise relationships between customers and your company, developing a direct and personalised connection. Know the characteristics of your customers, their needs and preferences. Plan, personalise and perfect the customer journey, identifying their preferred channels of interaction, whether digital or traditional. These are the main marketing strategies that can no longer be avoided. To win more customers and engage more people, through your website and otherwise, you need to be proactive and anticipate their needs, being attentive and making it clear from first contact how important they are for your company. Quality means satisfying your customers’ needs, surpassing their expectations and continually improving. Engagent is an innovative Customer Interaction solution that allows you to interact in real time with your customers thanks to its Artificial Intelligence (AI) and BOT systems, proactively providing the responses, information and assistance they require and anticipating interest based on their browsing behaviour on your website or mobile app. Engagent improves service experience for your customers and users thanks to machine learning technologies, and understands requests offering the most appropriate responses in natural language. Engagent offers users rapid, comprehensive assistance and proactive dialogue as part of an entirely self-service, real-time experience. Provide a simple, round-the-clock service for your users that is also economical for your company. InfiniteCRM is PAT’s Customer Relationship Management solution. It is fully integrable with your existing company solutions, and compatible with all corporate infrastructures. 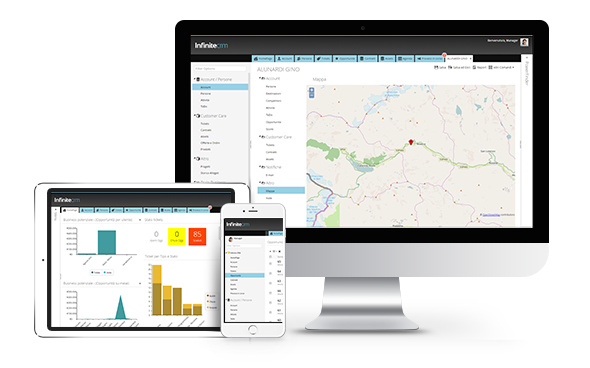 InfiniteCRM is an innovative platform that automates marketing activities directed at defined clusters and targets, planning direct and personalised communication with your customers. 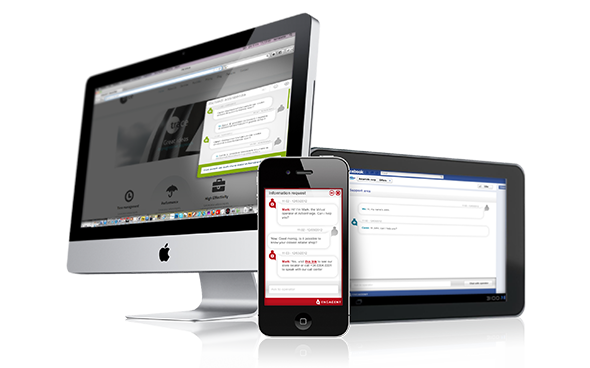 This software makes communications with new contacts, customers and partners more targeted, enabling you to achieve predetermined business objectives more easily. With InfiniteCRM, you can simplify and speed up your marketing processes, integrating them within a single centralised system. Teammee is PAT's Social Collaboration software which improves harmony within working teams, increasing their productivity and efficiency. Teammee tools increase Sense of Community and belonging within teams and trust between colleagues, in order to support and facilitate more collaborative behaviour which can only develop through dialogue, participation and promoting the value of individuals. 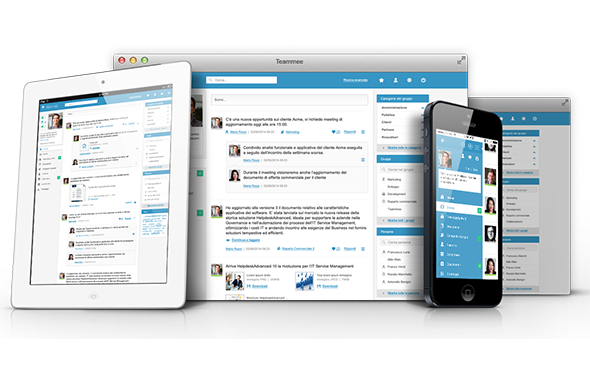 With Teammee you can create a virtual space for managing people and projects, sharing documents, managing activities and monitoring work progress. Interact directly with online users and customers. Enhance the value of relationships between people and your brand. Log your customers’ preferences and communicate with them, personalising your services. Offer people positive and meaningful experiences. Become a customer-oriented business and increase customer trust and loyalty. Offer people a positive and engaging Brand experience, and increase your business. It is not simply a question of “what”, but rather “how”. Track, plan and measure all marketing actions. Using results, or certain events, create new automatic activities to increase the value of your customers, generating new opportunities and helping to achieve your objectives. Rethink and reorganise the management of your work teams. Make your team management strategies more effective, to enhance staff productivity and performance and achieve your objectives faster and more efficiently. What do you need for your Marketing and Communication? Planning and implementation of focused and targeted campaigns for the purpose of creating strategic business opportunities and new sales. Organisation and management of marketing activities designed to generate new potential customers through specific campaigns and business strategies. Optimisation of marketing strategies and activities through the visualisation and analysis of results, obtained in order to improve their performance.